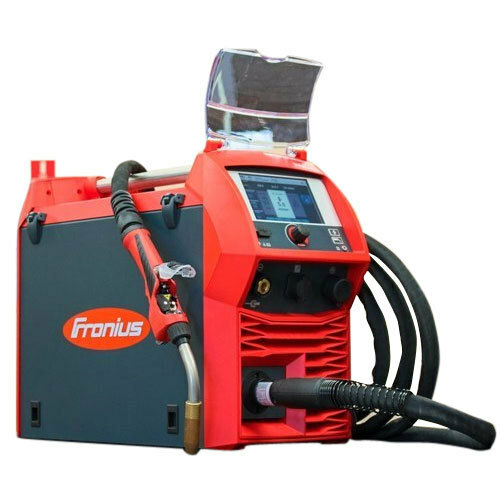 We are ranked amongst the most trusted firms deeply engaged in offering a wide range of Fronius TPS 270i/320i C Pulse MIG Welding Machine. Fronius System Connector: The Fronius System Connector is a central connection point for all media. It lets users lock the hosepack simply and safely, with no tools, to guarantee a reliable current transfer. This results in shorter maintenance times and quicker replacement of wearing parts. Plug & Weld: All components can be connected easily and with no tools Thanks to the automatic component recognition, the system always knows which components are connected and warns of any incompatibility. This means inefficient misadjustments can be ruled out almost entirely. Speed Net: A 100 Mbit/s data bus ensures data exchange of components. SpeedNet enables more rapid communication, precise process control and the retrieval of all system statuses in real time. No grid-voltage dependence: The power sources are available in country-specific variants, meaning they can also be used in regions with differing mains voltages. For more information, please contact your local Fronius contact. Established as a Sole Proprietorship firm in the year 2006, we “Vision Enterprise” are a leading Trader of a wide range of Abrasives Wheels, Cutting Wheels, Welding Machine, etc. Situated in Ahmedabad (Gujarat, India), With the support of our vendors, we are able to provide these products in diverse specifications within stipulated time period. We offer these products at reasonable rates and deliver these within the promised time-frame. Under the headship of our mentor “Mr. Prashant Patel”, we have gained a huge clientele across the nation.